On June 11, 2008, Prime Minister Stephen Harper stood up in the House of Commons and apologized for Canada's notorious residential schools system. The system removed young Aboriginal children from their families and sent them to schools often far from their communities — to strip them of their heritage in an attempt to assimilate them into the dominant culture. As the Prime Minister stated in his apology, "There is no place in Canada for the attitudes that inspired the Indian residential schools system to ever again prevail." Each year since, June 11 has been commemorated as the National Day of Reconciliation: a day to remember a tragic chapter for First Nations people and the government's pledge to work with First Nations to undo the damage left by a cruel and inadequate school system. In commemoration of the National Day of Reconcilation, UFCW Canada supports the Our Dreams Matter Too campaign. The campaign is led by the First Nations Child and Family Caring Society of Canada (FNCFCS) to bring culturally based equity for First Nations children. Send a Letter to the Prime Minister to show your support for the campaign. Post a button on your organization’s website to link to the FNCFCS / Our Dreams Matter Too webpage. Participate in the Our Dreams Matter Too walk taking place in Ottawa on June 11, with your organization’s banners raised high in support of this initiative. 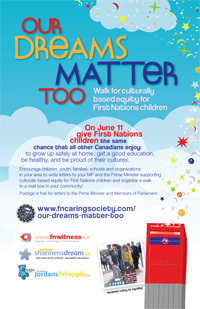 Organize your own walk on June 11, at your workplace, or host a walk in support of the Our Dreams Matter Too Campaign. There are no rules. It can be big or small, long or short, over a lunch hour or a walk in a nearby park, either on June 11, or choose a convenient date that works for you. 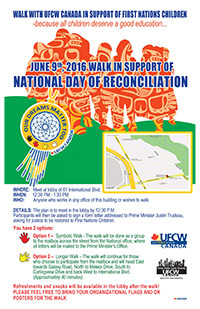 Join the UFCW Canada National walk on June 9 to support the Our Dreams Matter Too campaign. All are welcome to participate in this Toronto-area event. The walk commences at the UFCW Canada National Office, 61 International Boulevard, Toronto, Ontario, at 12:30 p.m. Participants will have an opportunity to sign a letter to Prime Minister Trudeau asking for justice to be restored to First Nations Children. If you can, join us for a 40-minute walk, with refreshments and snacks back at the starting point. By walking with your fellow union members, neighbours, and community partners, or by participating in other walks in your area, you will be showing support for First Nations children to be afforded every right to succeed while respecting their cultures and languages. You can also donate and show your support for other FNCFCS campaigns including Shannen’s Dream, Jordan’s Principle, and the I Am a Witness campaign.